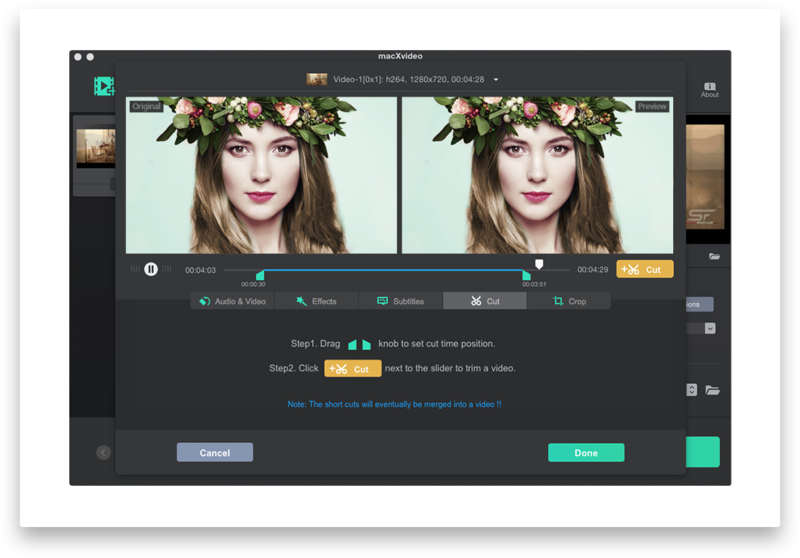 macXvideo is a free 4K video processing software that makes video encoding, editing, resizing easy and fast for everyone. 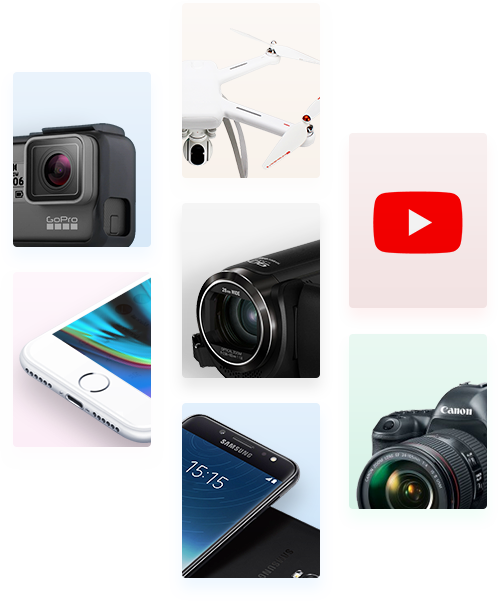 Anyone at any skill can quickly convert 4K, HD videos into any needed format and make stunning videos for precious moments and share with friends via YouTube, Facebook, Whatsapp, email etc. No more issues in format compatibility, file size and video quality. Process video in munites. 100% free. Powerful feature. Simple tools. There are plenty of situations that require you to convert video to a desirable format, compress large video files, process 1080P, 4K, H265/HEVC, SD video for playback anywhere. 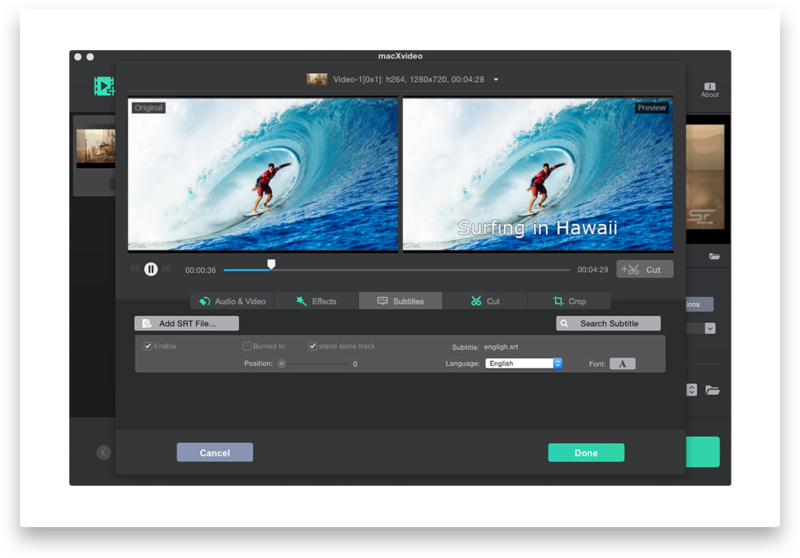 macXvideo comes with professional-grade video converter and built-in video editing tool. 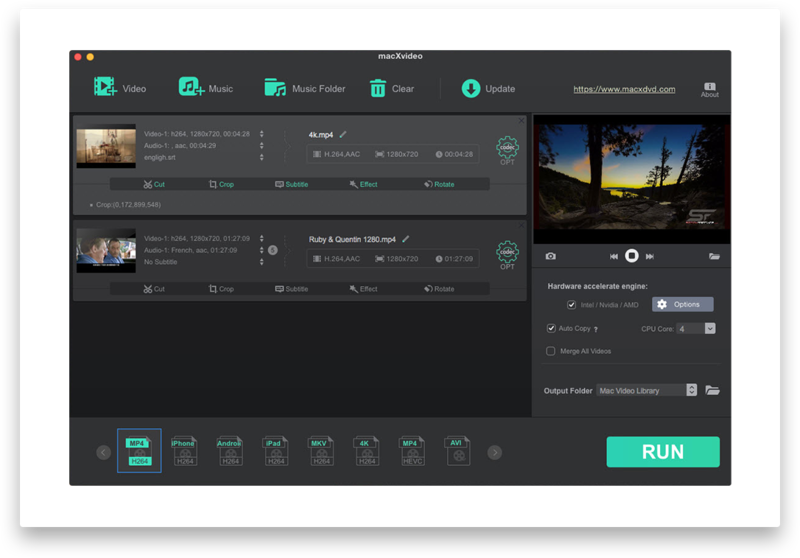 Whether you're a noice or have some video-editing experience, and whatever the final platform or format you need to deliver video to, macXvideo has it covered. Transform raw footage into engaging video. Intuitive drag-and-drop controls let you quickly cut, trim/split, rotate, add subtitle and apply effects to your video. macXvideo can shrink high frame rates (HFR), high-res (esp. 4K, 6K, 5K, 8K) and long video to small size, while preserving 98% quality of the original media file. It excels over any other free video converter, providing the industry’s broadest support for video codecs & profiles, including 4K, HEVC/H.265 videos. Working on video in virtually any format, codecs, quality and size, macXvideo ensures you be in complete control with footage recorded by smartphone, iPad, tablet, camera, DSLR, DV, Camcorder, action cam (GoPro), drone, car DVR etc. This app also accepts the video you downloaded or captured, and the movie ripped from DVD or Blu-ray disc. 1-click conversion, top-notch output. 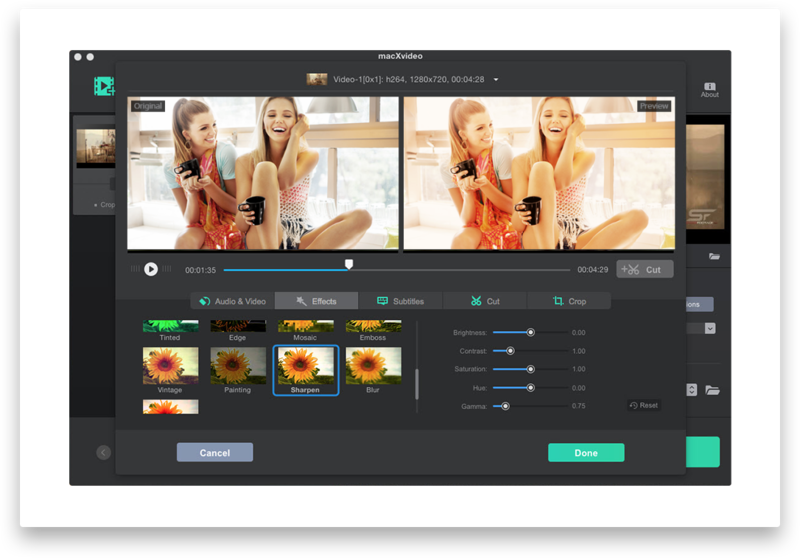 macXvideo serves as an entry-level video editing software with the user's needs in mind. Apart from basic features, you will also find advanced options such as audio volume control, playback speed, lightness etc. Furthermore, you could preview the resulting video in real time. No expertise is required to give your video a professional look, it is perfect for YouTubers, amateurs, parents, students. Cut video, split a video into smaller pieces. Merge multiple video segments into one file. Add special effects and subtitles as desired. Crop/rotate video to fit different any screen. Supporting over 370 codecs, macXvideo allows you to transcode any video with 100% original quality and exceptionally fast speed. Convert video into various formats, and make it optimized to a vast number of iOS, Android mobile devices, media players etc. Meanwhile, this app is on the cutting edge of technology with seamless support for 4K video HEVC/H.265 and up to 8K resolution UHD. Convert main formats, new video formats,MOV, MP4, HEVC, MKV, AVI, etc. Convert and optimize video for iPhone, iPad, Android devices. FLAC or iPhone ringtone at one time. Select one audio track and/or subtitle stream in the multiple-language movie. Keep or remove the soft subtitle stream before video conversion. Decode new Apple standard HEVC/H.265 to H.264, MP4 or other format. The fastest video processing speed, widest codec and 4K support make macXvideo stand out among free video converter software. The built-in video editor turns the painstaking post-production task into a simple work. Everyone can create great video without the expense and delays. Powered by level-3 hardware acceleration (Intel QSV, NVIDIA CUDA/NVENC, AMD) tech, it delivers 5x faster speed than others. High-Quality Engine and De-interlacing ensure that output video will preserve the quality of the original file. Watch high-definition video anywhere. Thanks to the drag-and-drop operation, preset profiles and easy video editing mode, video processing becomes simple and efficient. macXvideo is the best free tool I could find to process ultra HD video on Mac OS X. I tried some online video converter services before, but they either don't support processing 4K video content or require me to install the additional plug-in. Some other video converter supporting 4K video require a subscription or license key. I used macXvideo to compress an AVCHD video from my Canon HD camcorder and was very satisfied with the result. The original file is 432 MB, then I selected H.264 MP4 codec and converted it 1080P. The exported MP4 file keeps a high quality and is now only 32 MB in size, perfect for uploading to YouTube. macXvideo is really intuitive to use and useful. You only need to drag the videos to the software main UI and the software will give show you the most popular video formats and preset profile for many mobile devices, and you only to choose one and tap "Run". Every operation is simple. macXvideo gives you a simple and blazingly fast way to process and edit 4K, 2K, 1080p HD video. Six Methods to Process and Resize GoPro 4K Video Without Quality LossWe'll explain how to compress and reduce file size of GoPro 4K videos without quality loss for YouTube, Instagram, email, Dropbox, WhatsApp, Adobe Premiere Pro, etc. GoPro 4K Video Stabilization: How to Fix Shaky GoPro Clips Stabilize your GoPro Hero 5 Hero 6 (4K 60fps) video footage to produce Hero-7-style super-stabilised time-lapse 4K video through post-processing.